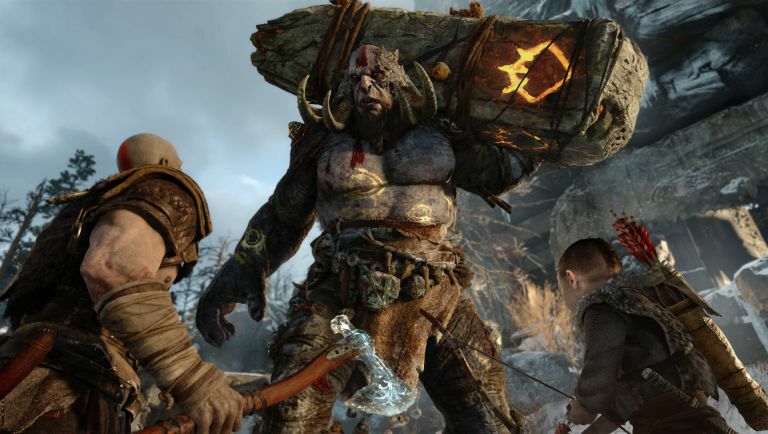 Much rumoured, but thankfully not leaked at any point, the reveal of a new God of War at the start of Sony's E3 2016 Conference last night was the perfect way to kick of the PlayStation show. And it's no poor HD revamp either - this is a new game, with a new setting and new beard. Kratos with a beard! Why, we don't know, but whatever the reason the former God of War has just doubled up on his manliness. Alongside that warrior's facial hair, Kratos finds himself living a quieter life in what looks like a fantastical Norse setting. Fantastical because it not only includes nasty looking enemies made of wood and golden sap (who explode when struck by Kratos' blue rune-infused axe), but behorned giants who use stone pillars as weapons and dragons. And not a bloody Targaryen in sight. Oh and Kratos now has a son. Yes, that Norse setting hasn't just seen the angry Spartan learning to hunt and track animals (the series know has an XP system of sorts based upon 'Knowledge' as you discover new areas and locations), but procreating, too. Kratos was always a pretty two dimensional character, so adding in an emotional connection with a little nipper in a dangerous world certainly adds a new dimension to the GoW dynamic. It's been ten years since the first God of War carved a path of destruction back on PS2, so clearly Sony and Sony Santa Monica want to give the series the kind of boost it's been crying out for since the incredible God of War 3 on PS3. We don't even know if this new GoW is a sequel to the previous games, but considering the dev could have gone with a new hero to go with its new Norse setting we're going to bank on this being a world altering follow up. The PS4 exclusive doesn't have a release date yet, but expect it to drop sometime in 2017.